We all know the story of the princess that has to kiss endless amounts of toads while eagerly awaiting one of them to turn in to Prince Charming. 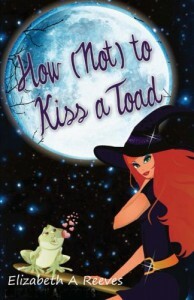 How (not) to Kiss a Toad is a play on that classic fable. It has a cute premise and I always enjoy stories about women looking for Prince Charming and realizing he doesn't exist. By the way...all you girlies out there, this is a lesson better learned really early on. Don't believe in fairy tale perfection. They don't exist, all people have flaws.Every guy Cindy kisses turns into a toad, the uglier their personality ~ the uglier toad they make. It's not a permanent transformation, they change back in a matter of days. Until Nathan, that is. Nathan is one toad that doesn't seem to follow any magical laws and his toadhood is threatening to get Cindy's meager magical powers taken away for good.As if Cindy's lack of love life isn't stress enough, the bakery she works for is being closed and she finally meets a great guy that she'd love to kiss but is terrified he'll turn warty too. Timothy seems too good to be true. Because he is and I site what I said up in paragraph one. He's got some major issues outside of the charming personality he shows Cindy.While the story has a few little flaws, I still found it entertaining. Cindy blushes entirely too much and it got obnoxious, but I'm really splitting hairs there. Also, there were a bunch of magical mentoring meetings that seemed more to just make the story longer as nothing really seemed to progress through them. Again, not a major issue. The characters were all quirky and I liked that, I would like to see more of Cindy's roommates in future volumes, I think their stories could be a hoot.How (not) to Kiss a Toad is a quick and easy read. It's a fun, clean story that would make a cute chick flick. My favorite part of the book is all the fantastic dessert recipes Cindy cooks up and would so love a companion cookbook for this read, because OMG YUMMY stuff!!! This would be a good beach or airplane read but I'll warn you now: You will be hungry for gourmet cupcakes throughout much of the book Beware!